TOTOWA, NJ--(Marketwired - Jun 24, 2015) - Many people suffering from oral pain and discomfort do not realize this could be a sign of temporomandibular joint (TMJ) disorder, says New Jersey cosmetic dentist Jerry Strauss, DMD. This common condition can cause a variety of debilitating symptoms, including a popping sensation when the jaw moves, difficulty chewing, headaches, inability to fully open the mouth, and more. Dr. Strauss diagnoses and treats numerous patients with TMJ disorder at Aesthetic Dental Care of New Jersey and says he can effectively do so through the use of neuromuscular dentistry. While traditional forms of treatment for TMJ disorder only address the position of the teeth and jaw, Dr. Strauss explains that neuromuscular dentistry techniques go a step further to look at the muscles that control the jaw. To diagnose a patient with TMJ disorder, he utilizes state-of-the-art technology to measure the jaw's mobility against its relaxed state, as well as the tense muscles that control it. Based on this information, Dr. Strauss can determine whether TMJ disorder is causing the symptoms or if another problem may be present. Dr. Strauss emphasizes that the chronic joint problem does not need to be endured. He encourages anyone suffering from TMJ disorder symptoms to consult with a dental professional who utilizes and is experienced with neuromuscular dentistry. By doing so, Dr. Strauss believes patients can achieve the most effective solutions for their needs. 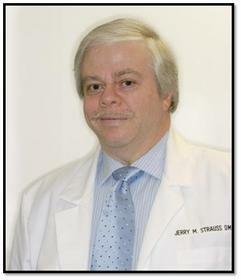 After receiving his Bachelor of Science degree from Syracuse University, Dr. Strauss attended Boston University's School of Graduate Dentistry. He then trained in a general practice residency at SUNY Upstate Medical Center in Syracuse, New York, where he earned his Master's degree. As a firm believer in continuing education, Dr. Strauss is also a graduate of the Las Vegas Institute for Advanced Dental Studies and continues to undergo postgraduate training here on a routine basis. Additionally, he has received the esteemed Mastership Status in the Academy of General Dentistry, resulting from his completion of more than 1,100 hours of continuing education. Dr. Strauss stays active in the dental community through his memberships in such organizations as the American Dental Association, the Dental Organization for Conscious Sedation, and the American Academy of Cosmetic Dentistry. He is available for interview upon request. For more information about Aesthetic Dental Care of New Jersey, please visit aestheticdentalcarenj.com and facebook.com/pages/Aesthetic-Dental-Care-LLC/120704677718.